Scikit learn was created with a software engineering mindset. It’s core API design revolves around being easy to use, yet powerful, and still maintaining flexibility for research endeavours. This robustness makes it perfect for use in any end-to-end ML project, from the research phase right down to production deployments. Scikit Learn is focused on Machine Learning, e.g data modelling. It is not concerned with the loading, handling, manipulating, and visualising of data. Thus, it is natural and common practice to use the above libraries, especially NumPy, for those extra steps; they are made for each other! 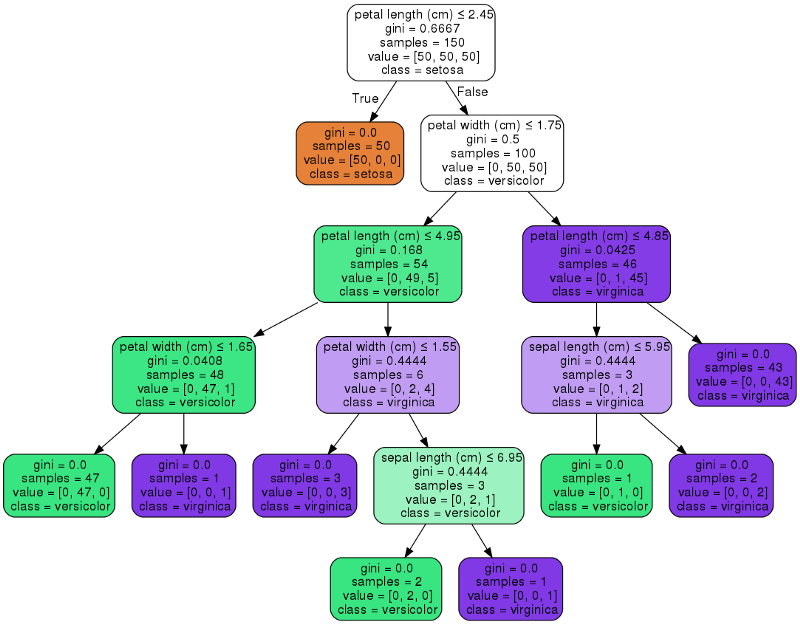 To give you a taste of just how easy it is to train and test an ML model using Scikit Learn, here’s an example of how to do just that for a Decision Tree Classifier! Scikit Learn also allows us to visualise our tree using the graphviz library. It comes with a few options that will help in visualising the decision nodes and splits that the model learned which is super useful for understanding how it all works. Below we will colour the nodes based on the feature names and display the class and feature information of each node. Beyond that, Scikit Learn’s documentation is exquisite! Each of the algorithm parameters are explained clearly and are intuitively named. Moreover, they also offer tutorials with example code on how to train and apply the model, its pros and cons, and practical application tips!